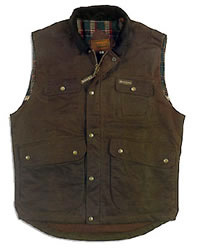 Vest is a very efficient insulator when worn with an oilskin coat or jacket. A real knockout. Ideal for all outdoor activities as vest allows for free arm movement, yet keeps upper body warm. This unisex garment is fabricated with market-proven oilskin. Exceeds ASTM's stormproof specs for rainwear. This fully lined garment features five pockets, zip closure, storm flaps, corduroy lined collar and handwarmers.